Poori is favorite childhood recipe .I hope all kids love Poori. Adding veggie to their favorite recipe as a secret ingredient they wont complain. 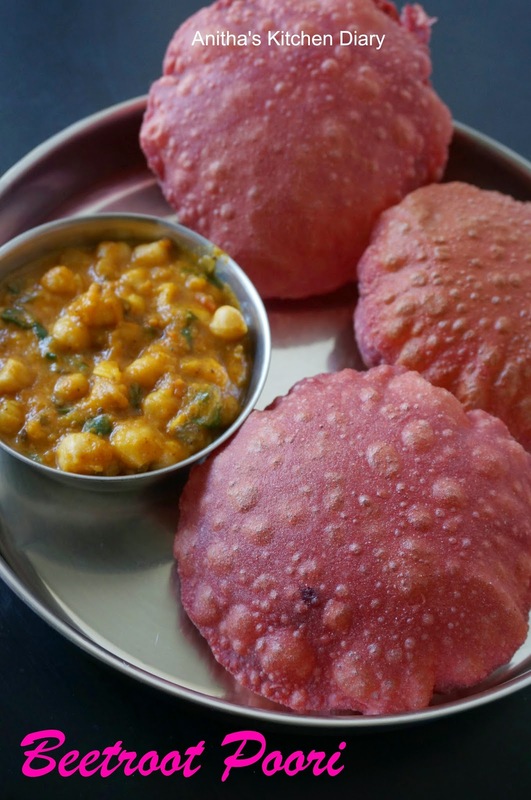 Beetroot Poori is good way of adding veggie to their diet. Wash and chop the beetroot roughly and blend it in a blender until smooth.If the beetroot is dry while grinding add small amount of water. Divide the dough into equal size balls and roll into circle using rolling pin. Mean while heat oil in a kadai for deep frying. Once oil hot put rolled dough into oil and cook on both sides. Repeat the process for remaining dough. Wash and soak channa for overnight. Pressure cook the channa for 4-5 hisses. Heat a tsp oil in a pan, saute the ingredients given under To saute and grind except channa and let them cool. Once cooled blended it in a blender along with cooked channa. Heat oil in a pan,add ginger garlic paste and cook til raw smell goes.Now add onion and cook til translucent. Now add tomato and cook til mushy. Now add blended masala paste, red chilli powder and channa masala.Cook til the spices cooked well. Once cooked add water and let it boil for 10 - 15 minutes. Now add cooked Channa dal and cook til your desire gravy consistency. Garnish with coriander leaves and serve with roti or Poori.